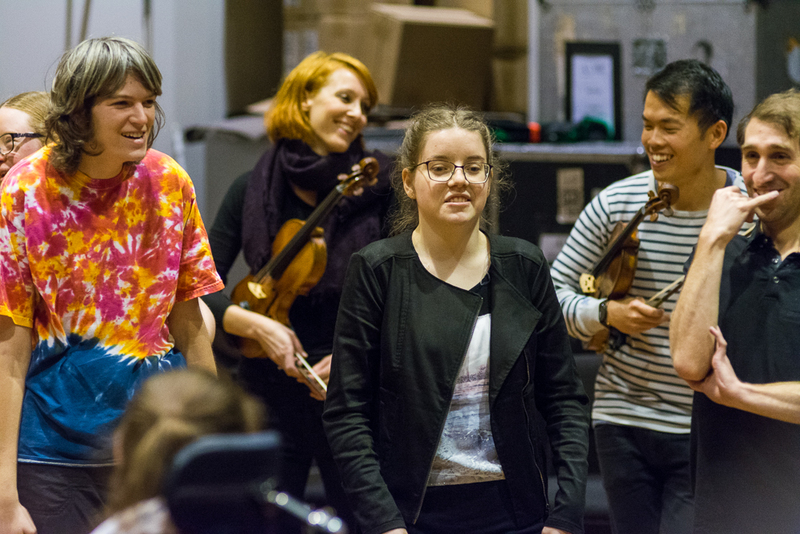 In June, an exceptional young composer from Lismore, Tilly Jones, was invited to work with the Australian Chamber Orchestra (ACO) as part of the ACO Move Program, which works with young adults with a disability. On Tuesday 20 June, ten young adults came together for four sessions with facilitator Dean Watson to create a performance piece using Tilly’s compositions as their inspiration. Tilly lent three of her pieces to the program so that participants could create movement in response to her music. Fifteen-year-old Tilly currently studies through the Southern Cross School of Distance Education and the Northern Rivers Conservatorium of Music. She can play five instruments and has been composing since she was nine years old. 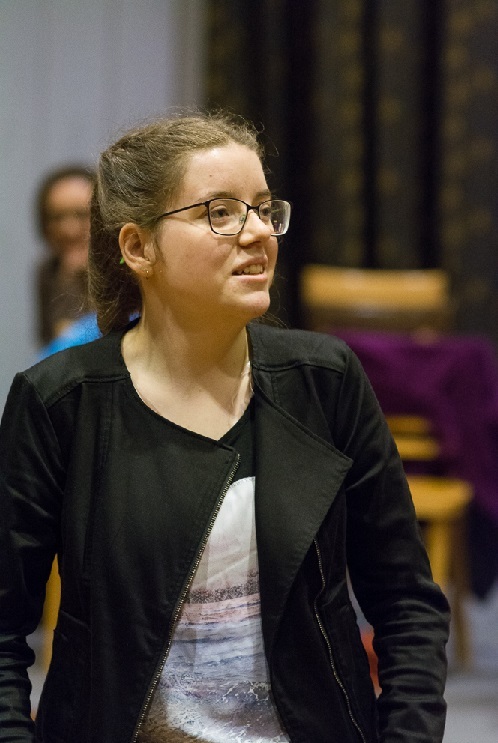 Tilly had the opportunity to work with ACO Violinist, Maja Savnik, to develop her compositional ideas, which were then performed by a quartet of ACO musicians. She has also formed a relationship with writer and spoken word artist, Emily Dash. Together they have written a poem inspired by the story of one of Tilly’s compositions. Tilly, tell us about your involvement with the Australian Chamber Orchestra and your music. Earlier in the year, I was approached by the ACO where they play music to people with disabilities and each year they use a different composer’s music. They found about me through my documentary. I’ll be Skyping in with the ACO MOVE quartet and I will have sessions before the concert with the musicians. I will also go to Sydney and watch the concert and be involved with the concert. Tell us three things that have helped you to get to where you are. 1. My mums – they help me; 2. The Northern Rivers Conservatorium and my teachers; 3. The teachers. What are some of the barriers you have overcome in your life? My disabilities are physical – stuff that stops me from playing stuff. I know what I am doing most of the time. I play five instruments. Cello, piano, clarinet and guitar. I had to stop playing the violin due to my disabilities. At the moment, the cello, followed by guitar, piano and clarinet. I play in the Northern Rivers Conservatorium Youth Jazz Orchestra, Chamber Strings, World Music Ensemble, Northern Rivers Youth Orchestra, Cello Ensemble and Jubilee Orchestra. What are some of the things you do that help you to compose music? Playing music. I get a lot of ideas from the pieces I play. Do you ever feel overwhelmed by all the things that are happening? What do you do (when you feel overwhelmed)? I play more and I’ll go and compose more! If I have an exam, I do stress practice but if it’s not music that is stressing me out, I go and do music. If it is music that stresses me out, I play different music. What else do you do in your life other than music? I do Distance Education and computer club house. I went to Boston for a teen summit and I am part of a youth reference group called Care 2 Change, for kids in out of home care. We try to get the government to listen to those of us who have experiences in out of home care to make it better and improve the system, which has worked. We have had the Children’s Commissioner come and give us feedback after we visited her. Do you think your success with music keeps you motivated? Coming into Distance Education, how has this made things easier for you? I know what I’m doing now, as I left school in Year 7 as that didn’t really work out. I moved all my time to music during that time. Now I can balance my life. How has being at our Distance Education Outreach Centre helped you - what does this opportunity bring to your life? I’ve made friends. I get to connect with people who don’t just do music. For our staff – what do you find most valuable in how we contact you – do you prefer us to visit, phone calls, internet? They kind of all work. I’ve had a couple of visits. I’m going to France/Europe in 6 months in July. My parents are dropping me off in Paris and I’m staying with my grandma who is a musician who knows a lot of musicians. My Foster Uncle, who did a symphony has asked me to be a part of the orchestra that is commemorating battles that have happened in France - a musical tribute. Tilly, you are doing amazing things. Do you see yourself as someone that others could inspire to do like you do. Seeing other people play music, other people with disabilities. I can’t see myself not doing music, so I keep doing it. Every now and then I have bad days but its way better than I was in the past at a normal school setting. It’s less pressure on me to conform. Is this how you make your complex compositions? Yes I try and listen to Snarky Puppy. If all else fails, count and subdivide and listen to Snarky Puppy. With your career pathway already started with ACO with a contract and being paid, where do you envisage yourself heading to – what’s your dream? To keep composing. I don’t see myself as a solo performer, rather in an orchestra or an ensemble.